Pure white sand – Siesta Key Beach has the finest, whitest, smoothest sand anywhere in Florida. The sand of Siesta Key is made up of 100% pure quartz crystals that are just about as fine and soft as powder. Walking on the beach, you can often hear it squeak as you walk along. Surprisingly, the sand never gets hot, even under the most intense summer sun because it is so white. You won’t find piles of sharp, broken shells, Siesta Key beach sand always feels luxurious and comfortable on your bare feet. Safe swimming – Siesta Key is world renowned for the gently sloping beach – no steep drop-off. As you walk out in the water away from the beach, you will be amazed at how far you can go out since it is so shallow. The water is crystal clear almost year-round, so you can see where you are walking. 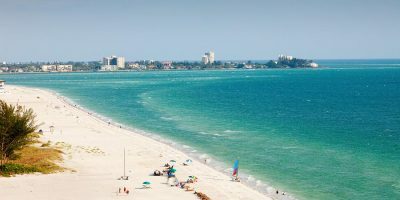 Long flat beach – great for walking – If you like to take long walks on the beach, then Siesta Key is the place for you! The beach is so flat, and because the sand is packed so firmly by the water, it makes a perfect surface for long walks. Almost three miles beach to walk makes for a great place to walk, jog, run or ride bikes – even pushing a stroller or jogging stroller. During the summer months there is even a fun run on the beach eacjh week. Everything you could ask for – Sarasota county knows what a gem it has in Siesta Key Beach and has provided all the amenities you could ask for. The beach is fully staffed with lifeguards and beach patrol. They have a full-service food and beverage concession and tons of tables and grills to provide everything you need without leaving the beach. If you would like to go up to Siesta Key Village for lunch, just hop on the free Trolley – the Siesta Key Breeze. For those who are mobility-challenged and desire some assistance getting out to see the water, they provide special beach wheelchairs are available that will easily get you down to the water’s edge. Need something else? They have Restrooms, showers, changing areas, volleyball nets, picnic tables, and even a playground.